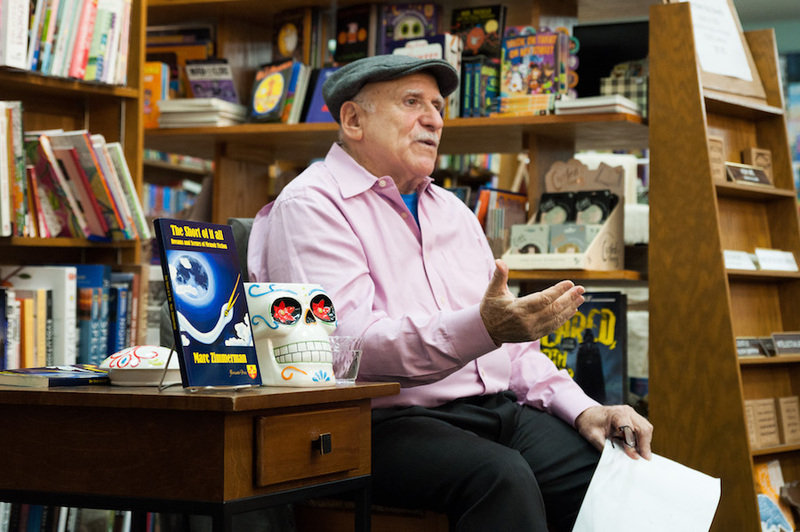 On Nov. 1, author Marc Zimmerman presented his latest book of short stories, “The Short of It All: Dreams and Scenes of Memoir Fiction” at the Avid Reader in downtown Davis. In addition to holding the title of emeritus professor at both the University of Illinois at Chicago and the University of Houston, Zimmerman has taught Latin American studies in Nicaragua, Canada, Argentina and Spain, among others. Zimmerman has authored over 30 books, and the event was focused on his fifth collection of short stories. Zimmerman, who began writing memoir fiction in recent years, has only hosted a couple of reading events so far. In “The Short of It All,” M deals with the struggles of writing, aging and controlling his weight, as well as heavier topics of anti-Semitism and the fear of death. Zimmerman sees writing as a way of beating death. During his writing process, Zimmerman likes to list things from his life he is interested in exploring. “I think of different people I’ve known, can I tell their story, is there a story they can be part of or do I have to invent a story to be part of them,” Zimmerman said. He then begins writing, creating descriptions of his characters and settings. The reading on Nov. 1 was an intimate event. Zimmerman created a welcoming atmosphere by personally introducing himself to everyone in attendance. As a presenter, Zimmerman was engaging and had an expert command over his audience. He wove humor into his anecdotes, sharing many lessons from a long life of travels and teaching. Zimmerman began the night with some facts about Día de los Muertos and then dove into a story set in Mexico called “The Sculpture,” which Zimmerman considers to be his best piece. “[Zimmerman is] one of the experts in the country in academia, in the art of Central America, the artists,” said Elaine Brown, Zimmerman’s sister. Zimmerman is the Founder of Global CASA/LACASA Books, which seeks to promote Latin American writing, culture and theory and has served as its Director since 1998. A set of stories, “Out of Gas Triptych,” stars M as he runs out of gas in the middle of nowhere and attempts to bargain with difficult storeowners. Like many of Zimmerman’s pieces, “Out of Gas Triptych” is based on a dream. The second part of the story finds M trying to write “Out of Gas” while on an airplane, and the third part introduces a woman on the flight who observes M trying to write and is thoroughly amused, a sort of meta twist to the plot. Several of the stories come directly from Zimmerman’s life experiences. “Paris and Venice: Racism and The Three Wives Triptych” focuses on the racial profiling Zimmerman and his wife experienced while abroad. A more comedic piece, “The Parking Space,” details an incident in which Zimmerman was able to convince a man who rudely stole his parking spot to relocate. Zimmerman hopes to continue publishing stories and hold more readings. “The Short of It All” and his other works are available for purchase on Amazon. The Avid Reader hosts writers like Zimmerman weekly. Authors can range from lesser known and local to more prominent and international. Events are listed on the bookstore’s online calendar. Everyone is welcome to attend these events and support the authors.